Now that I have read your information I am going to redo it. If you would let me know if the following information is correct it would be appreciated. I will re-level the ground (it has about a 6" fall) using a proper laser level, digging an area wider than the pool (about 16'). I will put the metal frame together then lay 2" thick concrete pavers in a full circle of the pool ensuring the legs sit on a full paver. I will make sure these are all at the same level. Then I will fill the area with sand to the same level as concrete pavers, wetting it and tamping it down. If the sand is the same level as the pavers would it matter if part of the pool liner sits on the pavers? Hi Mo. I think you have a great plan. The only thing I do not like is the liner sitting on the pavers. Since the bottom of the pool curves back in away from the supports it really shouldn't sit on them. I think I would just make sure the blocks are pulled back far enough to the outside that they are away from the liner. If that is not possible you could always lay a layer of plastic or something over them. Just about anything would work to give the pool a little protection from any possible sharp edges. Researching whether putting pavers under whole pool vs. under just the legs of pool makes most sense. Last year I used wood under each leg and one or 2 shifted. I have read that under weight pavers can crack and ruin the level. Not sure what to go with and what is recommendation. Hi Ann If you are worried about the pavers cracking go with a thicker ones, like 2" or more. Pavers under the whole pool is not bad as long as there is padding between the blocks and the pool liner. We have very Rocky sloped land and have dug out the 18 ft which is hard cus we have literally boulders to break an inch down in the ground so we have bought plugboard and 1 in foam sheets to level and place, all my hubby got was the board and sheets which don't seem quite right to me, can you tell me a good tutorial for this method or maybe what you would do? Hi I would level with something like crushed granite, pack it solid and then use the foam sheets. My 18x48 Intex pool is up and ready to go. However the level is off by up to 3 inches on one side. Is that big or is that okay? Hi Rick. Three inches out of level is something you will want to take care of at some point. Whether or not the pool is being stressed by it being out of level is not something I could say for sure without seeing it. If the pool appears to be up straight it might be all right for the summer. I would sure take a close look at it. If the pool is leaning or appears to be bowed or stressed on one side I would drain it and re-level. Two to three inches off level is in that gray area of being safe or not being safe. Many other factors involving the installation come into play. If you have any doubts about how the pool looks you are probably better off fixing it. 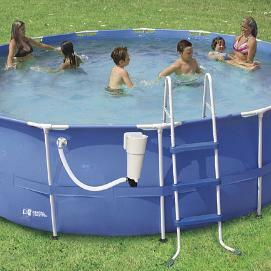 We have greatly enjoyed our 15'x48" round Intex steel framed pool, but are wondering what to do with it for the winter? I read the entire instruction manual and it does not address this issue. I have done on-line searches and have yet to see advice on this issue. We live in Oklahoma where it usually gets down to 0 degrees and sometimes with a wind-chill it can get 20 below 0. Do we put the top on the filled pool with a beach ball underneath to make a pitch for run-off? Will the cold make the soft liner brittle and cause it to crack? Do we take the pool down and if so, does anyone have any suggestions as to how to dry out the huge liner and store it? Any suggestions will be greatly appreciated. Hi Susan. If it were my pool I would take it down for the winter. You drain it with a garden hose and then towel dry the bottom. Store the pool out of the weather for the winter and it will probably last a lot longer. 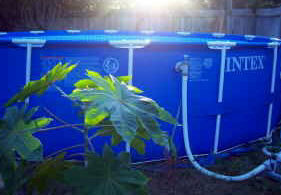 Others may have other ideas about how to prep an Intex pool for the winter, if so, we would love to hear them. We have had an above ground pool for the past 8 years and we have learned something new every year. The first three years we would take to pull down every winter dry it out (or so we thought), just to put it up the next spring and have it full of holes from cracks. It was always stored out of the cold weather and we towel dried it always thinking that we have done everything right. It's here we ended up having to use our extended warranty to get a new one. Finally on the fourth year we decided to leave the pool up for the winter. We winterized it as if it were an inground pool with Winter pool chemicals, we put two of The Winter pool pillows in it ( which really aren't for runoff so much as to make sure that the water freezes towards the pillows instead of expanding the outside walls) and we covered it with a tarp and a winter cover and staked them down ( because the Winter Covers if not stick down we'll pull off or blow off). The first pull we decided to do this with lasted the next three years no holes no cracks and stayed level. These pools were always a soft side metal frame pools. We live in Nebraska so you know how quirky our weather can be and it gets really cold here in the winter. 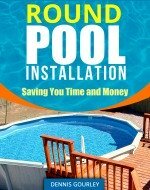 To summarize my opinion to all those Above Ground Pool owners would be to leave your pool up in the winter and just winterize it as if it were an inground pool. Hi Susan. I'm also in Oklahoma and I just leave mine up and uncovered. I don't drain it - I'm afraid it would get brittle and crack but you definitely want to store your pump and accessories. Once a week or so I'll go out and net the leaves out. I am installing a 16FT X 48" INTEX Ultra Metal Frame Above Ground Pool. This is my first time installing a pool. I would like to know how much sand is needed to put under the pool after ground has been leveled. Also, what is the best option to use for a base? One more thing, what type of tarp would you recommend to put under the pool? Hi. 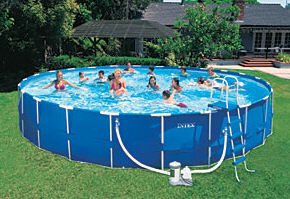 An Intex pool is not that much different than any other above ground pool. The ground needs to be perfectly level. The ground needs to be level and packed solid. Never assume the ground is level until you have used a leveling device on it. It is money well spent to rent a transit from you local rental company. Set it up and get that ground perfectly level. After that you could cushion the area with a couple of inches of sand. That should be about two tons. The ground tarp could be landscaping plastic, a pool pad like gorilla pad or a plain old tarp. It may not even be needed if you have no grass or weeds to deal with. There is nothing wrong with setting the pool on a smooth base of mortar sand. As far as pool base goes, start with solid packed and level dirt. You could also use crushed granite or crusher run, these both level easily and pack solid. On top of that add a couple inches of sand and set the pool up. You should be fine. If the pool has support legs that need to be supported, as most frame pools do, use concrete or wood blocks under each one. I use my laser transit on each one of these so that they are all perfectly level. The result is a level pool with a soft bottom, free of lumps, bumps and rocks. We installed an above ground 18'x52" pool yesterday. When we prepared the ground it was level. After filling it with water it seems that the lower side that we raised is still lower. The water on the low side is about 2-3 inches deeper than at the other end. Will this be okay??? Should I do something?? Hi Sarah. The pool will probably be just fine if it is not perfectly level. This is something I would probably fix during the off season when the pool is not being used. You would be a lot happier with a level pool, they look nicer and tend to be safer and last longer. You may also want to check your pool instruction booklet and see how much variance in level they allow. If the pool warranty requires you be within certain limits you may want to fix it sooner. I am looking at a 16' x 48" inch frame pool. My Patio slopes away from the house at the rate of 1 inch per 8 feet, so I should be looking at 2 inches difference from one end to the other. As I understand it, this still isn't good enough. But what is the best way to level off on a brick patio surface? Hi Paul. If you mean a steel wall pool this would apply. The easiest way I know of to level a concrete area is to set the rail and footplates on roofing shingles. The shingles can be added as needed to keep the rail level. They also do a great job of keeping the sand on the inside of the pool because they can be layered in such a way as to create a tight wall. I would use a sand base on the inside of the pool because it would be easy to add more to the raised side of the pool. By adding more sand to this area you can hopefully keep the pool bottom level. Having a level base of sand will make installing the liner easier and probably make it look nicer. Wrinkles tend to develop in liners where one side of the pool fills before the other. Pools should fill from the center out, evenly in all directions. A soft side pool is a whole different story. I think I would first try installing it on the patio without any changes. This just might work out fine.